Coach Yourself Thinnish: How Will YOUR Losing Weight Affect Everything that is NOT You? What effect will losing weight have on the wider systems in your life? Wider systems include but are not limited to family, friends, work, neighborhood. It is true, no-(wo)man is an island unto herself, and how she changes ripples out and affects her systems. It is wise to consider how losing weight, creating a healthy lifestyle will impact on and inform your family, your friends, your job, your community. How will healthier food choices, new ways of cooking, your becoming slimmer, fitter and healthier affect your family? Your friends? Your circles of people? Whether your answer is good, bad or neutral, it’s good to know. Yes, it’s useful to know where and how your circle of influence begins and ends, where your circle of support begins and ends. Think it through and add your comments below and/or join Our Lady of Weight Loss’s KICK in the TUSH Club/FB! Sign up for the KICK in the TUSH CLUB monthly e-newsletter, sign up here. To join the FACEBOOK/KITT Club, click here! 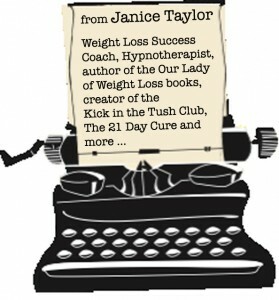 For one-on-one coaching, contact Janice!